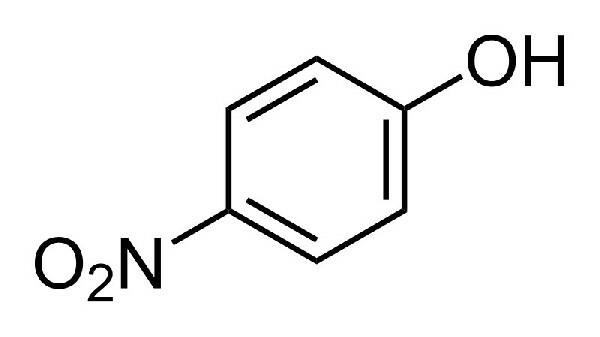 4-Nitrophenol is a chemical used to manufacture drugs, agrochemicals, dyestuffs. It has the application as a pH indicator in analytical chemistry. 4-Nitrophenol (PNP) is a colorless to slightly yellow crystalline solid with no odor. It is slightly soluble in cold water and carbon disulfide but soluble in hot water, hot benzene, alcohol, chloroform, acetone, pyrimidine, toluene, ether, fixed alkali hydroxide solutions, and carbonates. It is more dense than water. Stable but incompatible with strong oxidizing agents, strong bases, organics, combustible material, reducing agents. Combustible. It sublimes and is slightly volatile with steam. 4-Nitrophenol is used to manufacture drugs (as an intermediate in the synthesis of paracetamol, 4-nitrophenol is reduced to 4-aminophenol, then acetylated with acetic anhydride). Most (87%) of the PNP produced is used in the manufacture of ethyl and methyl parathions, but the compound has itself been used as a fungicide. However, derivatives of 4-nitrophenol have been reportedly used as leather fungicides. It is also a common metabolite from a variety of compounds and a biomarker of organophosphate (OP) insecticide exposure. PNP is used as the precursor for preparation of pH indicators (colorless at 5 and yellow at 7). Solution of 4-nitrophenol alone appears colorless or pale yellow, whereas its phenolic salts tend to develop a bright yellow color. This color-changing property makes this compound useful as a pH indicator. Precursor for the preparation of phenetidine and acetophenetidine. Chemical intermediate in the production of N-acetyl-p-aminophenol dyestuffs. In peptide synthesis, carboxylate ester derivatives of 4-nitrophenol may serve as activated components for construction of amide moieties.